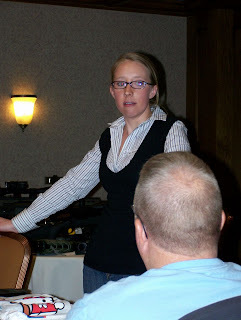 Once we returned from Cabela's we had a few minutes to swing by our rooms to change clothes and clean up a bit before heading back to the hospitality room for meeting with Ashley Varner from the NRA, followed by Show & Tell. Ashley Varner of the NRA. 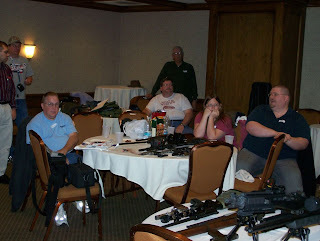 We had a good discussion with Ashley about the gun bloggers, the election, political issues, and so forth. 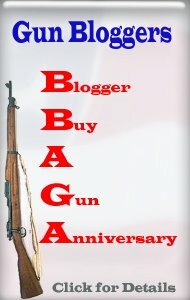 Ashley also brought along some very cool NRA shirts, plus bumper stickers, buttons, and more. 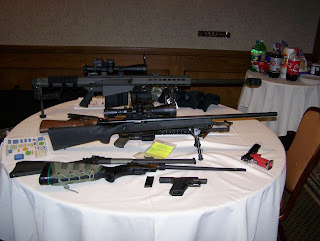 Part of the Show & Tell stuff. Everything from an AR-7 to a Barrett 50. The red STI 2011 is the same one on the cover of Brownell's catalog #61. It shoots as well as it looks! 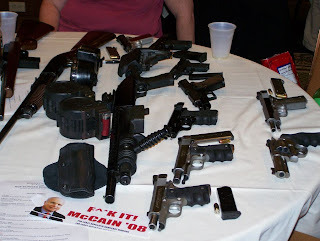 After Ashley and the NRA we moved into show & Tell. There was so much neat stuff there it would have taken two days to go over it all in detail! Even MORE Show & Tell! 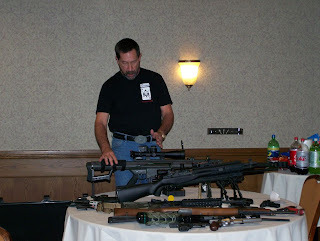 Kevin shows off his Para Gun Blog .45. 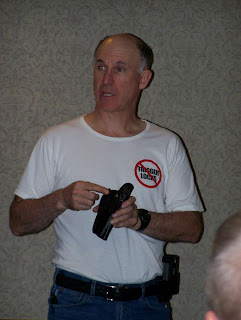 He explained a bit about the LDA (Light Double Action) trigger, and how he liked the Para. 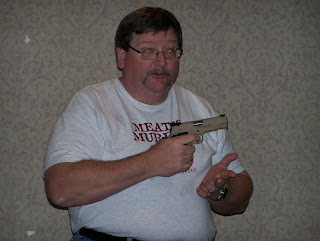 Joe talking about concealed carry holsters. 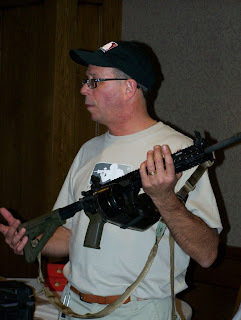 Joe also showed off his Para Gun Blog .45 and demonstrated the Crimson Trace grip and laser sight. After Show & Tell we had a little time to swing by our rooms, clean up a bit, change clothes, and head down to the hospitality room to head out to the Basque Banquet dinner. It was rather chilly out and just a bit farther than you'd comfortably like to walk, so we car-pooled up and headed over to Louis' Basque restaurant. The dinner was OK but nothing really outstanding. It was also a bit pricey. I later heard that the previous chef had left and the new one wasn't as good, but was improving. 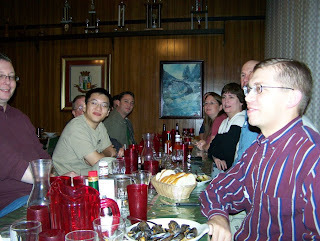 Even so, we had a great time over dinner. No one went away hungry. After dinner we all got back together for refreshments and conversation in the hospitality room. With all the refreshments, by the end of the Rendezvous we must have been REALLY refreshed!